A piano serial number is a unique set of consecutive numbers in code form, providing the initial information to date your piano. The serial number is not usually in any kind of date format, but tells you the number of pianos (upright or grand) manufactured up to the point of your number. For example, if your serial number is "124" , then your piano is the one hundred and twenty fourth piano made so far in the production line. The serial number will appear properly stamped either as a decal, punched numbers into wood (sometimes burnt in), rubber stamped, or printed in black ink and possibly mounted on a small plinth with a surround. Remember that there are several sets of numbers inside a piano, some are stock numbers, parts & cabinet numbers, keyboard numbers, mechanism numbers, company established date and Patent/ Exhibition dates.... some of these kinds of numbers are not traceable. If you see a date on your piano, this is not the date or year for your piano. Some mechanism numbers can be traced back to their date, and may require a separate enquiry. If you cannot find the serial number, remove all panels/ fallboard and if safe to do so, remove or recline the mechanism towards you**. Piano names shown in brackets below are an example of a piano with the serial number in this location, may vary. Serial numbers are never written in chalk, biro pen, pencil or normal hand writing - they are properly scripted usually in black. They are not part of another decal, nor expressed in date format DD/MM/YYYY - all serial numbers are unique. Depending on the maker's name, some pianos have the serial number located in its correct and original position, known as the Queen Bee. This must be located first, and supersedes any other format of numbers. The serial number may be duplicated elsewhere inside the piano (to back up the Queen Bee), and if so, usually stamped or punched in smaller lettering on the rear side of a cabinet part / pedal lyre / grand cheek block / mechanism, or other location. For example, Erard Paris grand pianos have their main Queen Bee serial number printed on the soundboard rim, under the music rest; the serial number is then duplicated on the reverse side of the front key rail, hammer flange rail - and the actual date (ink stamped) e.g. "1904" is stamped on mechanism part - Undercarriage lever, note A1. 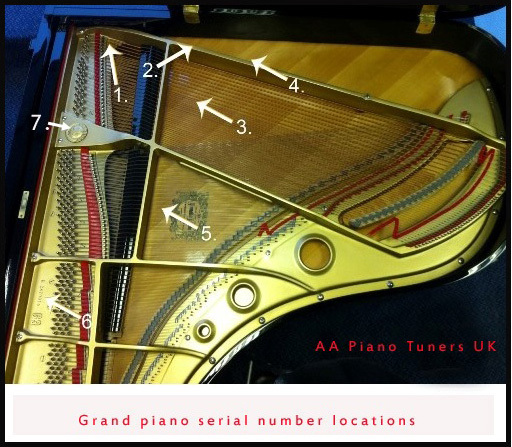 (Modern pianos/ Kawai/ Yamaha/ Bechstein/ Steinway) - this is the most common serial number location. 6. Soundboard - bottom right (Weinbach/ Brinsmead some mini pianos) - may be duplicated in location X, 1,2 or 3. 7. Behind bass strings - soundboard, stamped on a raised oval or rectangular plinth (Chappell, Bluthner, Bell London) - recline mechanism to view - may need a torch to see serial number. Serial number will be hidden by the bass dampers - may require a torch to view it. These numbers may be duplicated elsewhere in pencil on the rear/ unseen/ raw wood-reverse side of cabinet parts and panels. Check the serial number sequence just in case - it could be the serial number, but is usually not. There are exceptions - Upright pianos made by John Brinsmead of the early 1900s have their serial number in two places; 1.. At X, right side. 2.. at point marked 6, a decal serial number formed onto the right hand back post. Y. Not usually the serial number - numbers punched into the tops of the piano keys (first white and black key) - this is either a part number, or a stock number specifically related to the keyboard manufacturers only. These numbers (and parts nos) cannot be traced. **Only remove the mechanism if it is safe to do so. Check bridle tape condition, and check pedal lift rod connections - some are connected to the crank lever by a metal pin passing through a rubber grommet (see just left of Y), or screwed into position If the lift rods only rest under the crank levers, it is safe to remove and relocate the mechanism. If in doubt, consult a piano technician. Fold back the front lid and open the top lid fully using the prop stick. Remove the music rest tray fully - sliding it towards you. Your grand piano should look similar to above. 3. Soundboard area under bass strings, often with another decal or logo (Bluthner) - if not seen, wipe dust away. The serial number may extend anywhere along this soundboard apex area - look over dampers to view. 6. Near the tuning pins, below the music desk tray - either side. Most common place for a serial number. On some Steinway grand pianos, the serial number may be duplicated under location 1. **Remove mechanism to view numbers (facing you) - stamped on the left side bulkhead behind bass damper lift wires. On good quality pianos, the serial number may also be duplicated inside the piano mechanism/ hammer rest rail/ damper unit. This often a good way to confirm the serial number - but take care, some numbers are stock or parts numbers - right of 6. We have located the serial number...... what next? There are several ways in which to convert your serial number into a date (usually a year given only). The serial number will not give you an exact date, day or month.... only the year when it was manufactured - and some are estimated. Some serial numbers were never recorded, and some piano do not have a serial number, so we need to see the whole piano and its mechanism - 2 separate photos. 2. Contact "Pierce Piano Atlas" (google it), or buy the serial numbers book. 3. Contact the UK Piano Forum - History or Piano Advice section (registration is free). 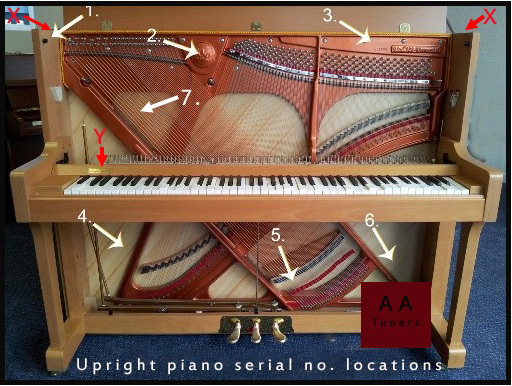 **AA Piano Tuners UK does not accept any liability or blame for damage to any part of the piano and/or its mechanism should it be incorrectly removed and relocated in searching for a serial number (or general curiosity). Certain very old piano with perished and worn parts should not be attempted to be removed by a piano owner, and they should seek professional help in contacting a qualified piano tuner/ technician. They can then check the condition of your piano and advise you. The above information is a guide only for general curiosity, and not intended for (++) buying/selling/ insurance/ valuation purposes or professional advertising (++); always seek a professional piano technician if the serial number is intended for (++).